School districts in Wisconsin are funded largely with a combination of state aid and local property taxes. The mix of these two revenue sources depends on district property wealth and student characteristics. School property taxes are indirectly controlled by the state through the revenue limit law. In 2015, 70% of school spending was for employee salaries and benefits. K-12 education is Wisconsin’s leading public service. The state’s 422 K-12 school districts educate more than 850,000 children each year. Moreover, state residents devote larger shares of their local and state tax dollars to schools than to any other program. In 2015-16, they paid $4.9 billion, or 46% of their local property taxes to school districts. And, the state spent $5.2 billion of income and sales taxes on various forms of school aid. Not only is Wisconsin’s tax commitment to schools significant, the way these monies are distributed among schools is complicated. With so much money at stake, a basic understanding of how schools are funded and where they spend their money is essential. 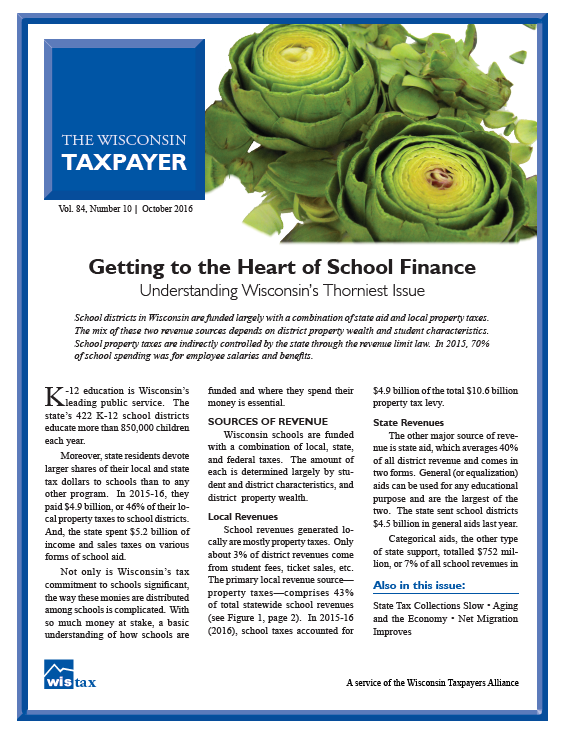 Wisconsin schools are funded with a combination of local, state, and federal taxes. The amount of each is determined largely by student and district characteristics, and district property wealth. School revenues generated locally are mostly property taxes. Only about 3% of district revenues come from student fees, ticket sales, etc. The primary local revenue source—property taxes—comprises 43% of total statewide school revenues (see Figure 1, page 2). In 2015-16 (2016), school taxes accounted for $4.9 billion of the total $10.6 billion property tax levy.